In 1868, at the invitation of Tsar Alexander II the plenipotentiaries of seventeen states met in St. Petersburg, the then capital of Imperial Russia, to attend an International Military Commission. Its three sessions, chaired by General Milutin, the Tsar’s Minister of War, led to the adoption of a document that, along with the 1863 Lieber Code and 1864 Geneva Convention, laid the foundation for the modern law of armed conflict. This document was the St. Petersburg Declaration Renouncing the Use, in Time of War, of Explosive Projectiles under 400 Grams Weight. Though termed ‘Declaration’, it had a full force of law for its seventeen States Parties and entered into force on 11 December 1868. 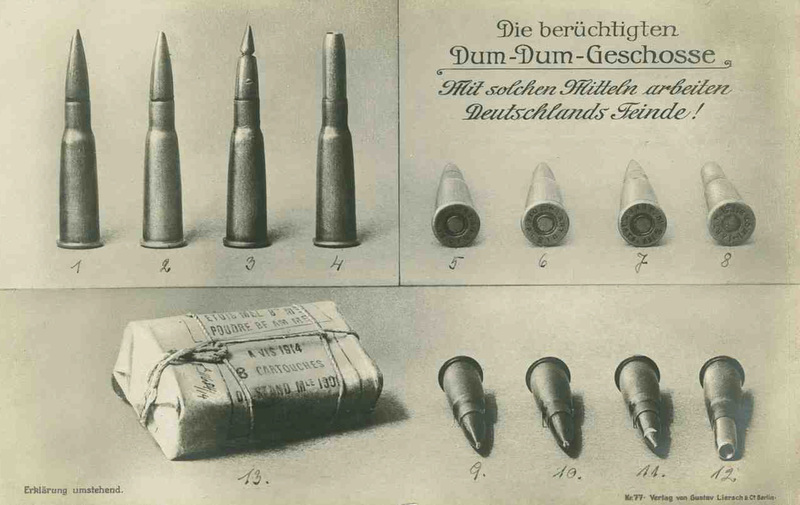 German World War I postcard, accusing the French troops of using “The infamous Dum-Dum-Bullets.” Published between late 1914 and 1918 (Landesarchiv Baden-Württemberg). By Liersch & Co., Gustav, Berlin [Public domain], via Wikimedia Commons. At the origin of the Conference was the development and production of a hollow rifle bullet, containing a substance which ignited on contact with the target. Introduced by the British in India for the purposes of elephant hunting, this particularly lethal ammunition was first used by the Russian army in 1863. Remarkably, the Imperial War Minister considered it improper to use such a bullet against human troops, with a strict order issued soon after that it was only to be employed against enemy supplies of munitions. In the years to follow, a rifle bullet was developed for the Russian Imperial Army’s use that contained a substance that exploded on contact with a hard surface. In 1867 its modification, a projectile that exploded on contact with a soft surface, was also introduced. Apart from the blast itself, which inevitably caused serious injury in human tissue, the expanding gases and the scattering of the casing fragments, significantly aggravated the victims’ condition, making an agonising death inevitable. Provided that other States also committed themselves to a prohibition, the Russian Government was willing to forsake the employment of such a projectile. The International Military Commission supported this Russian proposition and the declaration banning such projectiles was adopted. The underlying idea for the 400 grammes limit was that if explosive or inflammable projectiles were to be effective against military installations such as buildings, they would certainly have to weigh more than 400 grammes. If they weighed less they would be effective only against enemy personnel but would cause injury excessive of what was necessary to merely disable. The delegates effectively acknowledged that to render an enemy hors de combat, the kinetic energy of a projectile weighing less than 400 grammes should be sufficient and that explosive, incendiary, or any other additional effects should not unnecessarily exacerbate injuries from projectile strikes. Despite Prussia’s call at the Conference for the scope of the enquiry to be broadened to deal with the application of scientific discoveries to armed conflict in general and to that end to expand the proposed ban to other types of projectiles, the strong opposition of the British and French led to this suggestion being rejected. It is not the substantive operational part of the St. Petersburg Declaration that made history, though. Rather, it is its preambular paragraphs that laid down the principles which are fundamental to International Humanitarian Law even today. Recognizing that there are circumstances in which ‘the necessities of war ought to yield to the requirements of humanity,’ the Commissioners articulated the existence of limits to the choice of means and methods of warfare and fashioned an early formulation of the notion of military necessity. They also identified limits to acceptable levels of violence: only to facilitate the weakening of the ‘military forces of the enemy’. The condemnation of the ‘employment of arms which uselessly aggravate the sufferings of disabled men’ contains a clear articulation of the principle prohibiting superfluous injury and unnecessary suffering. In addition, causing harm to civilians became an illegitimate object of war. The raison d’être of the Declaration has come to be considered one of humanity. In fact, this term is used several times in its text and refers as much to respect for enemy combatants as it does to civilian immunity from attack. What is it precisely, though, that renders the adoption of the Declaration such a key event in the history of humanitarianism? Indisputably, the significance of the Declaration extends far beyond its proclaimed purpose. Not only is it a famous landmark in the long history of internationally prohibited weapons but its preamble articulates a set of principles that have been reiterated in a number of subsequent law of war and disarmament treaties and recognized by the International Committee of the Red Cross (ICRC) as part and parcel of customary international humanitarian law. The historian Geoffrey Best encapsulates the significance of the Declaration beautifully in characterising it as ‘a summary of law-of-war philosophy’, the ‘pithy excellence of which would never be equalled’ (Best 2002: p. 46). One might still be tempted to question the exact motives of Alexander II for convening the Conference, given that States generally are only willing to abandon weapons they either have no intention of using or that they do not want used against them. Regardless of the motives, however, and of a primary importance to those involved in hostilities remain the Declaration’s fundamental principles of necessity in the law of war, of limits to the use of means and methods of warfare, and its early articulation of the prohibition on causing superfluous injury and unnecessary suffering. This account is primarily based on the analysis of the wording of the 1868 St. Petersburg Declaration and subsequent regulations in international humanitarian and weapons law which help us understand the significance of the Declaration in which the use of a weapon developed through progress in military technology was renounced on humanitarian grounds. Schindler, Dietrich and Jiří Toman. The Laws of Armed Conflicts (Dordrecht: Nihjoff, 1988). Best, Geoffrey. War and Law since 1945 (Oxford: Clarendon Press, 2002). Boissier, Pierre. From Solferino to Tsushima (Geneva: Henry Dunant Institute, 1985). Kalkshoven, Frits. ‘Arms, Armaments and International law’. Recueil des Cours 191 (1985). Documents on the Laws of War, edited by Adam Roberts and Richard Guellf (Oxford/New York: Oxford University Press, 2000). Natalia Jevglevskaja is a PhD candidate at the Melbourne Law School and a member of the Programme on the Regulation of Emerging Military Technology (PREMT) at the Asia Pacific Centre for Military Law. Her thesis is focused on the duty of States Parties to the 1977 Additional Protocol I to the Geneva Conventions to conduct legal reviews of weapons under Article 36 of the Protocol. Natalia worked as a research assistant and a junior legal editor of the Max Planck Encyclopedia of Public International Law (2009-2011) in Heidelberg, and holds an LL.M in Public International Law from Utrecht University. She was a participant of the Global Humanitarianism Research Academy (GHRA) 2015. Citation: Natalia Jevglevskaja. ‘St Petersburg, 1868: First International Agreement Prohibiting the Use of Certain Weapons’, in Online Atlas on the History of Humanitarianism and Human Rights, edited by Fabian Klose, Marc Palen, Johannes Paulmann, and Andrew Thompson, 2015-12, urn:nbn:de:0159-20160905113 [2019-04-26].